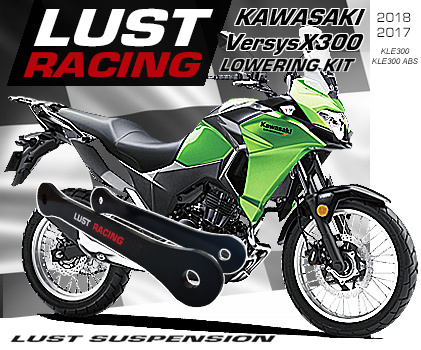 Kawasaki Versys X-300 lowering kit by LUST Racing. Perfect fit. Finished in corrosion resistant powder coating, color black with LUST Racing logo in red and silver-chrome. Supplied with installation instructions. Will fit Kawasaki Kawasaki Versys X-300 from year model 2017 to present. Lowers the suspension and the seat height by approximately 40mm.